Cenkos Securities is a UK-based independent securities company. The Company’s principal activity is institutional stockbroking. 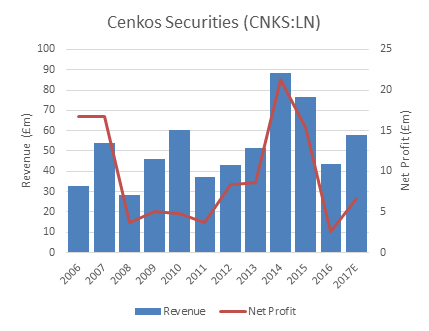 Cenkos provides corporate finance, corporate broking, research and execution services to small and mid-cap growth companies, and others, across a range of industries as well as investment funds. The chart below shows their revenues and profits over the last 10 years. The average net profit over the last 6 years is £10m, yet the market cap is £64m. If you take off £14m of its net cash to make that a round £50m ex-cash, that puts it at 5x its long run average earnings. So the question is, can the company have more successful years like 2011-2016 again in the future? I think it can, and what’s more, if it has another stagnant period such as 2008-2011, it still earned roughly £5m per year which makes the current market price already reflective of the fact. There are a couple of risks I see. First is the general equity markets, which is largely beyond the company’s control and foresight. The second is reputation risk. The company addresses this in the following excerpt from the last interim statement. So things look quite positive. But I can’t go on without referring to one blotch in its recent history however, regarding Quindell. In 2016, Cenkos was fined due to its failing to do due diligence to uncover the Quindell scandal when the company planned to switch from AIM to the LSE main market. You can read more on the scandal here. Needless to say there was some reputation damage. This is very healthy and contains £20m in cash and another £20m in short term investments. The latter is used for their market making, so isn’t distributable to shareholders hence shouldn’t be netted out of the market cap. I do however think a lot of the cash can be netted out. Share based compensation is becoming an ever larger part of the income statement which makes me uneasy, but most of the options available are exercisable far above the current share price. The effect is hard to gauge due to the vast share repurchases over the last 10 years. While the company isn’t perfect, it has the most important factors I look for, strong cash generation and it distributes the cash to shareholders (dividend yield 5.4% and share count reducing at a compounded rate of 5% per annum). I think there is a good margin of safety at current levels should the company earn only modest returns for the next few years. I’ve made it a 4% position in my portfolio. Nice find! I’ll have a look at it. Did you by any chance ever looked at Dignity plc. It just dropped 50% in share price and i’m considering taking a position. I took a passing glance at Dignity the other day, so haven’t done any real research on it. The thing that put me off is the weak balance sheet and the huge liabilities which I believe relate to prepaid funerals. I couldn’t really see a reason this isn’t in effect equivalent to debt as it will have to be paid in x years and they don’t have any reserves against it. I tend to favour companies debt free so this one wasn’t for me.